Imagine being able to image life as it happens by capturing video of the embryonic heart before it begins beating. A professor at the University of Houston, in collaboration with scientists at Baylor College of Medicine, is doing just that. 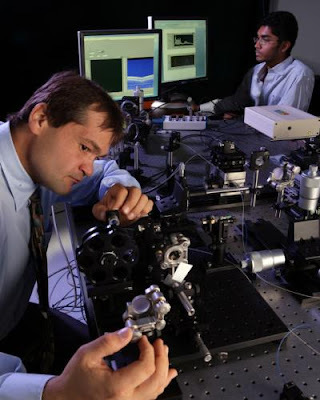 Kirill Larin, an assistant professor of biomedical engineering at UH, works in his lab documenting the formation of the mammalian heart through a high-resolution, noninvasive imaging device, providing perhaps the best live imagery taken of the vital organ. Using optical-coherence tomography (OCT), a technique that relies on a depth-resolved analysis created by the reflection of an infrared laser beam off an object, Larin and his colleagues at Baylor College of Medicine’s Dickinson Lab are using the technique to study what leads to cardiovascular abnormalities. Whereas ultrasound uses sound waves to create viewable, yet grainy, video images, OCT uses optical contrast and infrared broadband laser sources to help generate a real-time, high-resolution output. 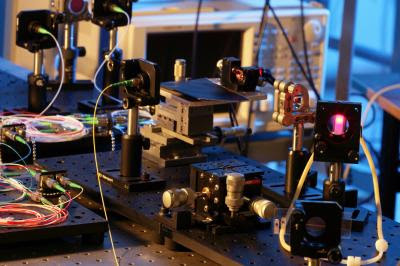 Pictured is an interferometer used in the experimental system developed in Kirill Larin’s lab, called Optical Coherence Tomography technique. Over the course of several years, Larin has been refining his laser-based spectroscopic imaging system to provide high-resolution images of protein biomarkers in blood samples and to study tissue samples to explore factors contributing to disease states. He has been working to adapt this technology to capture video of mammalian heart chambers, since they more closely relate to that of the human. With funding from a $1.7 million grant from the National Institutes of Health, Larin plans to modify the device not only to improve the resolution but also speed the imaging process to further the study of developmental processes in animals with known heart abnormalities. With these higher speeds and increased resolution, Larin says they will be able to observe the dynamics, what factors into the formation of the heart and what causes developmental problems. Ultimately, he and his collaborators aim to discover how different gene mutations affect cardiovascular development and reduce the number of babies born with abnormities, as well as shed light on how to prevent and treat heart-related problems before birth. The University of Houston, Texas’ premier metropolitan research and teaching institution, is home to more than 40 research centers and institutes and sponsors more than 300 partnerships with corporate, civic and governmental entities. UH, the most diverse research university in the country, stands at the forefront of education, research and service with more than 37,000 students. The Cullen College of Engineering at UH has played a vitally important role in educating engineers in Texas. Taught by innovative faculty, eight of whom are in the National Academy of Engineering, the college offers degree programs in biomedical, chemical, civil, computer, electrical, environmental, industrial, mechanical and petroleum engineering, as well as specialty programs in materials, aerospace, and computer and systems engineering.